Long exposure to the radiation of Dark Energon has changed DEAD END. The formerly talkative DECEPTICON mercenary now broods quietly in the shadows, staring hungrily at the power cores of his fellow warriors. He’s always freaked out the AUTOBOTS, but now even his friends think he’s scary. And that’s because he is. DARK ENERGON has unpredictable effects on anyone it touches. 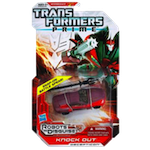 With DEAD END, that has resulted in him feeling a hunger that normal fuel does not satisfy, and an attraction to the darkest places in the DECEPTICON base. Converts from robot to vehicle! The dangerous DECEPTICON warrior DEAD END converts from a wicked sports car to a dark robot fighter and back. His double laser swords attach to his robot or vehicle mode to get him ready for any combat situation you can imagine. Battle him against your other TRANSFORMERS figures! Includes: Converting DEAD END action figure and 2 laser swords. Features: Double laser swords!